This trip will give you the opportunity to travel to some of the most visited areas in beautiful Costa Rica – a country diverse in its landscapes and its wildlife. You arrive in the Central Valley for a visit to the Poas Volcano National Park. A visit to La Paz Waterfall Gardens will show you Costa Rica’s flora and fauna and you’ll explore the canals of Tortuguero National Park. Located in the heart of the country, you will visit the city of La Fortuna and the impressive Arenal volcano. Walk through the rainforest and its Hanging Bridges and enjoy the most extraordinary views of the volcano. Travel to Monteverde to visit the renowned Cloud Forest Reserve, before heading North for a relaxing beach stay in Tamarindo, a lively beach town that combines high-end shopping, dining and lively nightlife with spectacular natural scenery. Upon arrival into Costa Rica, you’ll be met at the airport by your driver at Juan Santamaría International Airport. You’ll be driven to San Jose to begin your Costa Rican adventure. As we continue towards the Poás Volcano, we will notice the change in temperature and vegetation; we will see coffee plantations, fern, flower and strawberry farms along the way, creating a colourful landscape. The Poas is one of the most spectacular volcanoes in the country, with its enormous crater measuring one kilometre in diameter and 314 meters deep. The crystal blue sulfur pools will amaze you along with the steam rising from the various volcanic vents. We will also hike to the beautiful Botos Lagoon. The tour continues to discover La Paz Waterfall Gardens, a natural park where we will walk through some spectacular trails leading to the White Magic Waterfall. We will also visit the largest butterfly observatory and the impressive hummingbird gallery, the serpentarium, the old house, the bird house and the frogs’ exhibit. After lunch we will head back to San José. Early pick up from your hotel. Admire the biodiversity of an astonishing protected area in Costa Rica as the bus drives through Braulio Carrillo National Park. Stop en route to have a delicious typical breakfast. Along the road, you can observe many different kinds of products grown in this area such as pineapples and bananas. Board a comfortable boat upon arrival to Caño Blanco pier and let this extraordinary exotic paradise enchant you, as you travel through the Tortuguero canals. Enjoy a refreshing cocktail and a delicious lunch as you arrive at the lodge. In the afternoon, visit the picturesque town, the green turtle information centre and the beach area. Before dinner, free time to enjoy the pool or just to relax in a hammock. Tortuguero is a picturesque community originally founded by carpenters, fishermen and marine turtle hunters. Nowadays these same residents defend and protect turtles and other animals, and are an example of how a community can change its actions in favour of the environment, where both can benefit from them. This small town, which is less than 1 km long, has charming samples of Caribbean architecture, with very fresh and colourful wood buildings. It has its own school, church and a handcrafts centre next to the channels. Here you can find a few businesses, such as small grocery stores and mini markets where you can buy basic products. From July to September take a night tour to observe turtles nesting. After breakfast, guided walking tour through the trails. Free time before lunch. In the afternoon, visit Tortuguero National Park, exploring the canals in small, open boats to allow a better visibility. Tortuguero is a network of navigable lakes, rivers and canals (both natural and man-made) that are used for transportation, providing a great place for observing local wildlife such as birds, monkeys, two and three-toed sloths, American crocodiles and caimans. The park also provides shelter to endangered animals such as manatees, tapirs and jaguars. Free time before dinner is served. After breakfast, shared boat transfer back to the pier, where the trip will continue by bus to your next destination. Lunch is included in La Ceiba Restaurant. After lunch, continue your trip to the beautiful Turrialba Valley, either by private transfers or by driving yourself in an included rental car. Situated 40 miles east of the city of San Jose, the beautiful Turrialba Valley is irrigated by the wild waters of the Reventazon River, which has turned these lands into a rich agricultural area over a hundred years ago. Rains throughout the year create a green collage of primary forests, biological corridors, reforested areas, and extensive plantations of coffee, macadamia and sugar cane, demonstrating a perfect balance between agricultural development and the conservation of the wealth of nature. After breakfast, take a day at leisure or opt for one of the optional tours we suggest. The Pacuare River is ranked as one of the best five rivers in the world for white water rafting. This adventure begins near TresEquis town located one hour East of Turrialba. At arrival, guides will give an important safety talk to get rafters familiar with the necessary commands and safety instructions that will be needed on the river. After practicing all of the commands and drills, rafters will be ready to start the adventure. Shortly after, the excitement kicks up a notch as the first rapid approach. Halfway through the tour there is a stop at the camp located on a hillside with an awesome view to the Pacuare River and the surrounding mountains. Then after lunch, this rafting adventure continues down the river, challenging more rapids and discovering new surroundings. The tour finishes when the bridge in Siquirres town is reached. Canyoning has become very popular among extreme sport fans all over the world. It is specifically practiced in the natural geographic setting of canyons. This activity involves rappelling and descending cliffs and waterfalls within the canyon. This canyoning site is located in Calle Chirraca, a small, modest, yet lush private reserve near the town of Turrialba, which is an hour and a half east of San Jose. At the beginning of the tour, the guides will give an introduction talk and will explain how to use the equipment that is going to be used. The guides will make sure everyone understands the procedures for canyoning to have a safe and fun experience. After this, the fun starts. Participants will rappels down four waterfalls, zip-line five canopy cables, descend down two tall trees and walk across a 132-foot hanging bridge – an unforgettable adrenaline rush! After breakfast, transfer or drive to San Gerardo de Dota. San Gerardo de Dota is located near the Cerro de la Muerte, one of Costa Rica’s highest peaks. The drive from San José takes approximately two hours heading Southeast in the Pan-American Highway. As one drives up, marvellous views appear before the eyes: gorgeous views of green rolling hills and fruit plantations outlining one of the most beautiful regions in the country. An amazingly stunning habitat for a plethora of bird and flora species, this region is most well known for being the primary habitat for the famous resplendent Quetzal. The unequalled beauty of the highland scenery provides a unique opportunity to experience the sounds and secrets of the tropical cloud forest. San Gerardo de Dota is within the largest extension of protected areas of the country, an area made up of 13 different units which together total 95,000 hectares and highly recommended for nature lovers. Breakfast. Day at leisure to enjoy the area, walk the nature trails or to take optional tours. This hike will take participants along a trail leading to the dramatic Savegre River waterfalls. Charming views and colorful birds surround visitors as they walk along the river bank. It takes about an hour to reach the bridge where the first waterfall is found. After crossing it, the “cave” is reached, a huge rock carefully placed by nature’s hand thousands of years ago. The hike continues to a second waterfall with its imposing 30-metre (98-foot) falls. Bird watching is one of the fastest growing pastimes with more and more enthusiasts around the world. In San Gerardo de Dota visitors will find a place where birding is so good that it is the only destination in Costa Rica mentioned in the book “Fifty Places to Go Birding Before You Die”. Morning birdsong heralds the start of an unforgettable experience in the cloud forest. During breakfast the hummingbirds give the guests an indication of what their excursion will be like. After meeting the guide at the hotel reception, they set out on their walk. The bird list in San Gerardo de Dota has more than 170 species and some are endemic to the zone. Along the trails, participants will be able to find the most elusive and hard-to-spot species, real trophies for birders who want to increase their life list. The tour consists of short walks around the hotel or in their private reserve. Mornings, just after dawn, are the best time for seeing most species. After breakfast, drive or transfer to Dominical where you’ll spend three nights relaxing – one of the favourite destinations for surfers. The beach extends for more than 4 km and is surrounded by exuberant vegetation typical of the Pacific coast. This is not a massive tourism area, which makes it perfect for relaxing and enjoying nature. In the town of Dominical and next to the beach you can find some small restaurants that serve typical Costa Rican meals. Because this area is a fishermen community, seafood is the main ingredient in most of the dishes that are served in the restaurants of this region. Downtown you will find some small stores, houses and other businesses line up along the only way that goes to the beach. At the end of Dominical, close to the cliff known as Roca Verde, you can find some smaller beaches that are a fantastic destination, which gives a perfect idea of the incredible natural sceneries that you will find in this place. Dominical is very close to the Ballena National Marine Park, a spectacular place, which plays an important role in protecting several marine species such as the migrating Humpback Whales, the Olive Ridley and Hawksbill turtles. There are two whale migrations to calve in the warm waters of Marino Ballena. Antarctic families arrive in July and depart in November while their northern cousins from California and Canada come in December and leave in April. The small village of Uvita de Osa is located between Dominical and Ojochal, known for its exquisite culinary tradition. Here, the mountains of the rainforest loom over sea, sheltering the stunning pristine beaches of Uvita, Ballena, Arco, Piñuela, Ventanas and Tortuga. 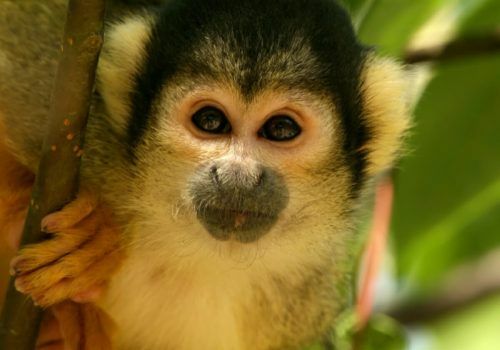 For day trips, the area is close to Manuel Antonio and Corcovado National Park. The Humpback whales visit the waters of Costa Rica and the Ballena Marine National Park between mid-July to October late (Southern Humpback Whales), and again from mid-December through late March (Northern Humpback Whales) as they migrate to and from feeding and mating grounds. The snorkeling is good only during the dry months (from late November through June) due to visibility. The Bottle Nosed Dolphins and Pacific spotted Dolphins can be seen year round. After breakfast you’ll take a private transfer to Juan Santamaría International airport for your onward journey.